For information, I advise of some impending utility works on Wey Hill, Haslemere. The works will be at the junction of St Christopher’s Road. The works are using two way temporary signals. These works are being carried out by Thames Water and are to install new water services. Due to the significance of this location, we have requested the works to take place in the school half term between Monday 16th February 2015 to Friday 20th February 2015. This entry was posted in Haslemere first and tagged Haslemere, Haslemere first, Roadworks, Surrey County Council, Utility Works on February 14, 2015 by admin. Invited by Patrick McLoughlin, Secretary of State for Transport to join an MSCP working group following a letter I sent to his offices expressing my concerns about the proposals to push through a MSCP without full consideration of all the facts. Attendees at the meeting: representatives from SWT, Dept for Transport, MP Jeremy Hunt’s office, HTC, WBC, Haslemere Chamber, SCC parking team. DfT representative explained that the finances of a multi-deck MSCP at Haslemere train station don’t stack up because the additional revenue from any extra spaces provided at the station are included as ‘costs’ rather than revenue. This is because all day parkers would incur a ‘cost’ in losing their access to free on-street parking having been effectively ‘driven’ into the MSCP by yellow lining and parking restrictions. SWT agree to pursue the additional 60 spaces on the Jewson’s side of the tracks currently used as a bus depot and to carry out a cost/benefit analysis for a single storey construction at the station. This would be a cheaper option (£2.5 m) and could provide an additional 150 spaces which is it presumed would be filled by those on the season ticket waiting list. I agreed this could a viable be an option if 1) no town wide, all day on-street parking controls were required, 2) a proper, open and transparent public consultation was carried out, 3) a new planning application was submitted subject to full traffic and environmental impact assessments. 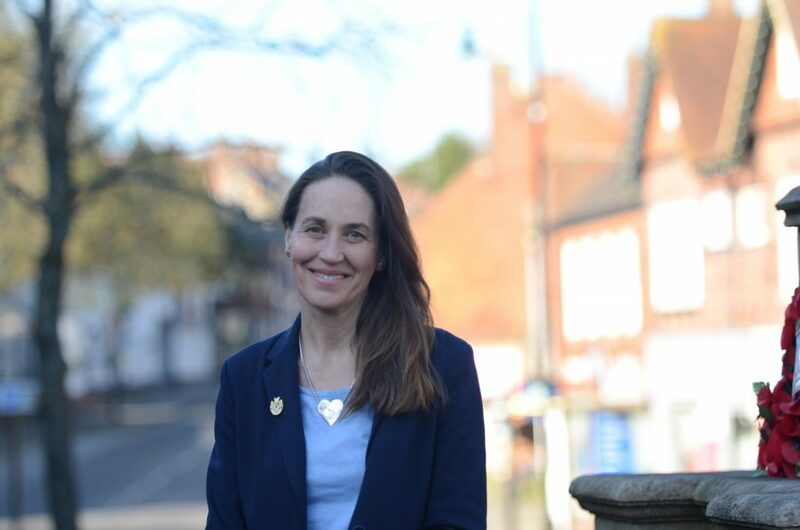 I also stressed that any decision on the MSCP should be made on the basis of what is right for Haslemere, not on political expediency and that I assumed that Haslemere Town Council would consult publicly if it intended to raise the precept/local taxes in order to provide a large contribution to the MSCP. I continue to believe a holistic transport strategy for Haslemere is needed going forward. The one deck MSCP and the use of the bus depot space should provide an additional 210 spaces at the station freeing parking space on our streets but only for a short period and then what? In the longer term more parking at the station will attract more cars, increase traffic/congestion and pollution in the town. There is potential for more creative transport thinking, Haslemere Vision is currently considering these issues. For example, season ticket data shows that a cluster of 338 commuters live in and around Fernhurst, suggesting opportunities for car and taxi shares/hoppa buses. In the longer term, a park and ride may be a viable option given the prospect of large housing developments to the south of the town. Project Horizon repair: Shepherds Hill to be fully reconstructed starting April 1st, 6 nights of road closure 20.00-06.00 hrs. Courts Hill Road and The Avenue to follow in immediate sequence. Shepherds Hill/Lower Street Railings: the case has been referred to SCC Customer Care team who deal with complaints across all services. Haslemere Town Council Planning and Highways Committee has submitted an objection to the railings. The railings were the project of ex-Councillor Renshaw and cost £40,000 (Members allocation, plus Local Area Committee contribution). Lower Street pavement resurfacing: recent resurfacing was carried out as part of the above project. Shepherds Hill tree: Agreed that existing split tree should be removed, and contributed £200 for new tree to be planted on adjacent grassy area, however investigations have revealed an air raid shelter too near the surface to plant a significant new tree. New discussions to enhance this ‘pocket park’, options include planting a number of smaller trees, bench and possible art work. Shepherds Hill angled parking. In January last year this change from angled to parallel parking was over-ruled by the SCC committee as 1) there had been no reported accidents here, 2) it provides vital parking spaces for the shops and 3) it provides vital parking for residents of Lower Street and Shepherds Hill who have no off street parking. Haste Hill: agreement with WBC and HTC to remove old railings and replace with wooden posts. Derby Road, St Bartholomew’s School: reached agreement with SCC that potholes will be repaired, anticipated repair date during Easter holidays. Serpent Trail Launch Event, Friday June 13th, 2014: Working with SCC and other partners to organise a community walk to celebrate and promote the upgraded Serpent Trail section linking Haslemere to the South Downs National Park. All will be welcome to join, more information to follow. Haslemere and train station identified as ‘gateway’ to South Downs National Park as part of Two Parks Project. Local Sustainable Transport Funding (£150,000) has upgraded the Serpent Bridal path from the Petworth Road, will provide new route signage, support a Sunday public service to Midhurst during summer months and fund a reconfiguration of the train station forecourt to facilitate bus use. Wey Hill Fairground Public Inquiry Cancelled: Waverley Borough Council dropped their application to redevelop the Wey Hill Fairground site and turn it in to a pay and display car park. I strongly objected to the proposal, and regret the waste of public money in pursuing this application given the very high levels of public opposition that forced a public inquiry to be held. Letterbox pilot project: Community building initiative as part of Families, Friends and Communities project to increase social capital in a local area. Haslemere has been identified as a pilot town for Letterbox. The project will start by end of March, and will start with a letter drop, followed by a series of conversations with residents to understand their interests, their needs and what they are willing to do to help others in the area. Participants in the project will also be offered membership to an on-line community forum. SCC Highways Strategy meeting: Discussions with SCC transport strategy team on the issue of transport and movement data available for Haslemere, essential for the development of a holistic transport strategy and to support the work of Haslemere Vision. Agreement that data available will be pulled together by SCC intern during summer 2014, data gaps to be identified with a view to further research. Conservation Area Appraisal for Haslemere: Input as member of CAA working group, following acceptance by WBC executive CAA report will be available for six weeks of public consultation, estimated to start from 14th April subject to approval by WBC’s Executive on 1st April..
Street lights out in Whitfield Road Haslemere. Discussions about potholes throughout the town, and in Kings Road, Hindhead Road, Shepherds Hill. Please report all potholes online here. You’ll find the Highways Incident Claim here on SCC’s website here. Referred the double yellow lines parking outside the station to the parking enforcement officers and the police. Notification of requirement for a new school governor. A Haslemere Primary School looking for a governor: One of our excellent local schools is looking for a governor to join the governing body, please do contact me if you would be interested in knowing more. Dr Helen Bowcock, High Sheriff of Surrey, reception to celebrate her very successful Shrieval year. Haslemere Herald, reception to open new offices in King’s Road. Haslemere Vision, Transport group and policy writing. Parking Review: formal advertising of the parking proposals approved at committee in December began 7th March. See my blog post last week about the consultation and deadlines to submit comments. Local area Committee meeting takes place on 21st March. See my recent blog post relating to this here. Surrey Libraries’ Children’s Book Award: Reading Groups are busy reading the 5 brilliant books shortlisted for this year’s Surrey Libraries’ Children’s Book Award. They are looking forward to a visit from one of the shortlisted authors and will be voting for their favourite book. The winner will be announced at the Award Ceremony at the H G Wells Centre in Woking on 30th April. There is still time for other schools to join in with the Award. For more information, go to our Book Award web pages – www.surreycc.gov.uk/childrensbookaward. Hashtag on Twitter is #OffThePageAward. Public Consultation: Review of the Surrey Rights of Way Improvement Plan (ROWIP). We are inviting comments on a review of the County Council Rights of Way Improvement Plan. The Plan was first published in 2007, this is the first review (Copy of Draft here). The criterion for this review is a ‘light touch’; however there have been changes to a number of linked plans and strategies since 2007, particularly with respect to policy context. Our five key objectives for improving rights of way have not changed. The Rights of Way Improvement Plan forms part of the Surrey Transport Plan. Improving and promoting the public rights of way network can contribute towards many County Council priorities set out in the STP and other plans and strategies, including some targets for health and well-being. Please do forward this on to anyone who may have an interest or may wish to comment. or by post to: Alec Baxter-Brown, Surrey County Council, Countryside Access, Whitebeam Lodge, Merrow Complex, Merrow Lane, Merrow, Guildford, Surrey, GU4 7BQ (please address comments as ‘Rights of Way Improvement Plan Comments’). There are a great number of new duties that local government has been required to take on since 2010. Here is a full list of duties attached for your information: New Duties for Local Government since 2010. February’s Scrutiny Bulletin. It is intended to give a brief summary of the work being undertaken by the Council’s Select Committees, as well as advising you of the dates for the next public meeting of each Committee: Scrutiny Bulletin February 2014. 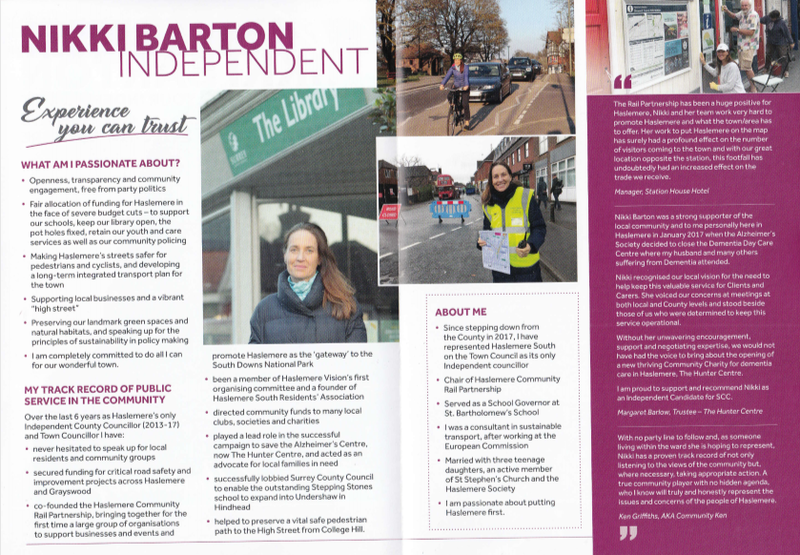 This entry was posted in Councillor Barton Update, Haslemere first and tagged Haslemere, Haslemere first, Independent, Surrey County Councillor on March 19, 2014 by admin. SCC’s Cycle strategy survey – www.surreycc.gov.uk/cyclingstrategy – closes on November 1st, 2013. The survey only takes 5 minutes to complete. Please do take part if you’re an individual or you’re part of a cycling club/organisation and you are interested in making our town a safer place to cycle. I am motivated by the fact our children and young people cannot cycle safely around Haslemere. Unlike children in towns and cities across northern Europe, most of our children are ferried to school and their activities by car. Children enjoy less personal freedom and independence, get less exercise, the cars they are driven in pollute and cause congestion, the time consuming taxi service provided by parents and carers creates stress for all and petrol prices continue to rise. Clearly the geography of Haslemere, built on hills with many narrow roads presents considerable a considerable challenge to cyclists, but I believe we can improve the situation. Safer crossings, and reducing traffic speeds are a first step to making cyclists and pedestrians feel more confident about leaving their cars behind. 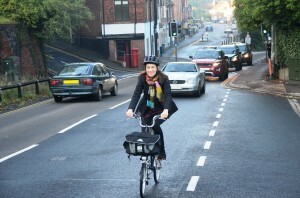 You may interested to listen to Surrey’s cycling debate hosted by BBC last week. Click here for audio. Making Haslemere a better place for cyclists can also bring economic benefits from cycle tourism. Haslemere train station has been identified as a ‘gateway’ to the South Downs National Park within the Two Parks Project (New Forest National Park, and South Downs National Park). Department for Transport Local Sustainable Transport Funds of £150,000 have been awarded to Haslemere as part of the Two Parks Project for initiatives to reduce the impact of traffic on the two parks. In Haslemere, funds are being used to upgrade a section of the Serpent Way bridle path, improve signage on the route and at the train station, and to support a summer Sunday bus service between Midhurst and Haslemere. Junction Place: Met with local businesses and residents concerned about dangers of rat running through the slip road occurring since new double yellow lining has removed parked cars. The white lining in response has not prevented the rat running. The loss of valuable on street parking spaces by double lining has also been identified as an issue. 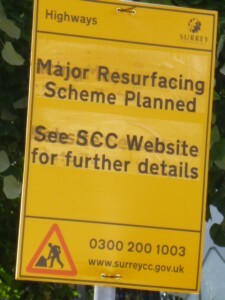 SCC Highways planned to install a bollard at the junction of the slip road with Hindhead Road, which on speaking with local businesses, I understand would impede their client parking and business vehicle access. I have agreed with SCC Highways that the yellow lining should be removed and the previous situation restored. The situation will be monitored to assess if a bollard is necessary in the future. Weyhill Road/Hindhead Road: confusingly not included in Project Horizon, SCC road refurbishment program. I have agreed with SCC Highways that a full repair of all potholes will be carried out in November, with a micro-asphalt top layer running from St Christopher’s Green to the ESSO garage to be laid in the spring. Derby Road, St Bartholomew’s School section: Ongoing discussions with SCC Highways and Education departments to find a way to fund repair of increasingly deep and hazardous potholes. Invited Linda Kemeney, Cabinet member for Schools and Education to St Bartholomew’s School. Very productive discussion on both the school expansion plans, and the state of the road. Pavements: Several stretches of pavement in the High Street are damaged. Haslemere currently has no funding available from SCC for replacement paving slabs, repairs are being made with tarmac. Fosters Bridge: Local area committee funds currently committed for investigation into flooding problem, I will be submitting a bid for additional LAC funding (2014/15) to action any solutions identified. Critchmere/Hindhead Road junction: feasibility study into traffic management improvements. 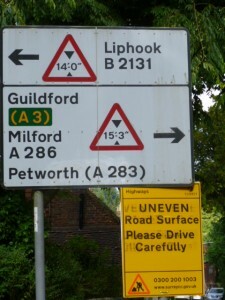 In addition SCC highways planning to prohibit left hand turn from right hand spur onto Hindhead Road to improve safety. Coomers Triangle: feasibility study into one-way system. I have requested that this study be expanded to investigate how to improve safety for cyclists, pedestrians and drivers at Courts Hill Road/Hill Road junction with Shepherds Hill/Midhurst Road. I will be submitting a bid for LAC funding (2014/15) to implement any recommendations. Weydown Road: issue of dangers caused by double-parked commuter cars raised by residents. Discussing possible solutions with residents, police and SCC highways. Residents permit scheme bays: in some locations question over efficiency of use of limited on street parking capacity with resulting negative displacement impacts. Courts Hill Road west: commuter parking creating access issues for residents. Junction Place: single yellow lining outside Methodist Church and small row of shops removed valuable customer parking, one hour parking restrictions on Lion’s Mead as church events often exceed one hour. Bridge Road: displaced cars now double sided parking causing an obstruction, police notices put on fencing to reduce hazard risk. Kings Road: Yellow lines by The Herons were filled in. Two Parks Sustainable Transport Stakeholder Conference: Brockenhurst, New Forest. Attended in my role as SCC ‘champion’ for Haslemere within the Two Parks Project. A very interesting event looking at the future of sustainable transport in the New Forest and South Downs National Parks, while celebrating what has already been achieved. Brighton’s Fun Way to the Beach, Beach Bus, and the New Forest bus, cycle and Twizy (one man electric cars) tours, www.brandnewforest.com, demonstrated what can be done. Richard Hammond, Chief Executive of Greentraveller, illustrated the power of social media campaigns in promoting sustainable tourism. His message was that selling ‘an experience’, rather than a destination is the most powerful marketing tool. I believe Haslemere could be marketed using his approach, an idea I discussed with Richard and intend to follow up. You may be interested to view this BBC item, New Forest and South Downs National Parks discuss green transport. One Team Working Together Workshop, County Hall, Kingston: bringing together members of Local Committee’s and Community Partnership teams aimed at building relations between officers and members, and looking at how stronger links can benefit the residents of Surrey. Waverley Local Area Committee, Cranleigh. Sept 20th. Click here for meeting agenda, decisions and draft minutes. Requested that the Surrey Cycling Strategy be given proper consideration on next year’s agenda. The next Waverley Local Area Committee meeting will be on 15th December 2013, in Godalming Baptist Hall. Haslemere and Western Villages Task Group meeting, Churt Pavillion, Churt: Discussion with SCC Highways and Waverley Borough and Town Council representatives for Haslemere setting priorities for Local Area Committee highways improvements budget 2014/15. The budget available to the Waverley LAC for highways improvements will not be specified until March 2014 at the earliest, however last year £800,000 was allocated to the LAC to be shared among Farnham, Godalming, Cranleigh and Haslemere and Western Villages. The agenda I have set for Haslemere (some listed above under Funded Highways schemes) includes: improvements to resolve recurring flooding at Fosters Bridge, ‘gateways’ on the approaches to the town, feasibility studies to improve pedestrian and cyclist safety at the Hill Road/Courts Mount Road crossing, the Lower Street/Shepherds HIll junction, and to consider a green way for cyclists/pedestrians avoiding Fosters Bridge in conjunction with a signed network of cycle, walking routes, an additional pedestrian crossing at Weyhill, replacement of the broken railings outside Claytons Jewellers in the High Street, and decluttering to remove redundant signage in the town. I also requested that a refurbishment of the red safety banding on the A286 entering Grayswood should also be included in the priority list, however I understand that this will be carried out during the Project Horizon road resurfacing planned for 2014/5. Sturt Farm Development, Pre-Planning Application Consultation, Haslewey, Haslemere: Raised my concerns with planning consultants about additional pressure of the 150 planned homes on primary school places, Haslemere primary schools are currently close to maximum capacity, and on traffic flows on Sturt Road. The lack of an adequate pedestrian path/crossing from Sturt Road to Kings Road in the plan at present is of concern. Haslemere Vision, 2nd Visioning Workshop, Lady of Lourdes Church Hall, Haslemere: community engagement event. Please take the time to fill in their Engagement Survey. 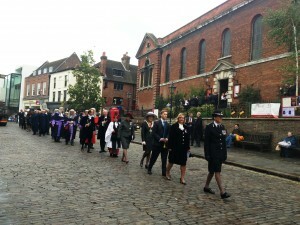 Service for the Judiciary, Holy Trinity Church, Guildford, at the invitation of the High Sheriff of Surrey, Dr Helen Bowcock. 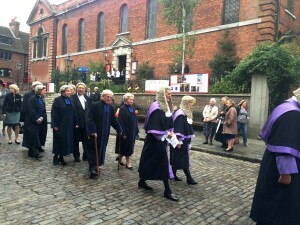 An annual service is held to celebrate the start of the new legal term and to offer support to those responsible for keeping the law of the land. During the service the High Sheriff read an Affirmation of the Shrieval Promise, a tradition that dates back hundreds of years. 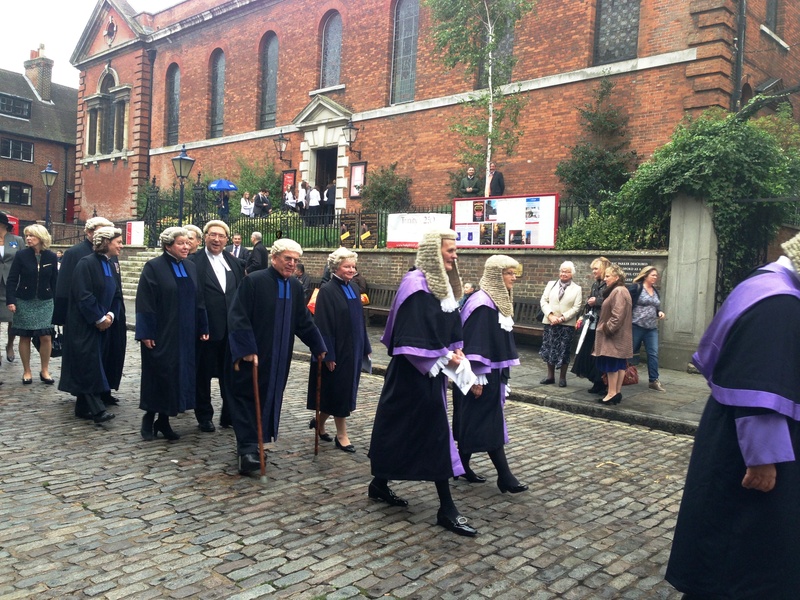 Read press coverage and see more pictures of the Service for the Judiciary here. Waverley Local Area Committee Private Briefing: Wey and Arun Canal, proposals for Compasses Bridge, Surrey cycling strategy, and Surrey schools briefing. Full Council meeting, Kingston, October 15th. : Click here for agenda and reports pack. spoke to support Lib Dem motion promoting openness and transparency in decision making. St Bartholomew’s School, Safer Travel Workshop: Presentation by St Bart’s travel coordinator outlining the issues of travel safety, inconsiderate parking and congestion around the school. Parents, staff and local residents discussed ideas including more walking buses, car sharing, increasing scootering and cycling as possible solutions going forward. Haslemere30 Food Festival: Introduced local schools cookery competition. Residents Association/Independent Group, County Hall, Kingston: Finance briefing outlining significant financial pressure on SCC budget combined with a high level of uncertainty as central government funding to local authorities is cut back further (2013, 10% real terms cut in total local govt funding) . Meanwhile demand on education, most notably the need to provide additional primary school places, and social care provisions grows. Surrey residents receive the lowest Formula Grant support of any county area in England and the third lowest of all English upper tier areas. Budgets in all SCC departments will need to make significant savings 2013-18. Rex Cinema Memorial Service, Junction Place. 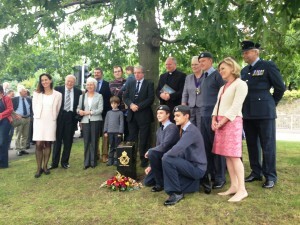 and unveiling of memorial stone at Junction Place. Local resident Mick Bradford has worked tirelessly to research the crash of an RAC fighter plane into the Rex Cinema in 1942 in which 3 young airmen died. This weekend, the Met Office has issued an Amber WIND Alert which covers all of London & SE England to cover the potential impacts from a low pressure system. This warning also mentions the potential impacts from the rain. The Met Office warning can be viewed on Hazard Manager. Hazard Manager also has some graphics under the ‘Events’ triangle showing possible tracks of the system. Gritting: Salt stocks are ready for winter – Surrey County Council’s barns have been filled up with 16,000 tonnes of salt ready for ice and snow this winter. Surrey will also be able to call on more than 40 specialist gritting vehicles and a small army of farmers with tractors and ploughs to clear roads across the county. Haslemere’s salting routes are outlined here. If you are a twitter user, please also follow @surreytravel for up to date information on gritting and weather, as well as other travel alerts for Surrey. Lion Lane Post Office. I received a letter from the Post Office saying the Post Office branch in The Co-operative on Lion Lane is going to be modernised. This is part of a three year investment and support programme. The new look Post Office is scheduled to open at The Co-operative, Lion Lane on Monday 11th November 2013 at 13.00. It will need to close for refurbishment on Monday 4th November at 17:30. 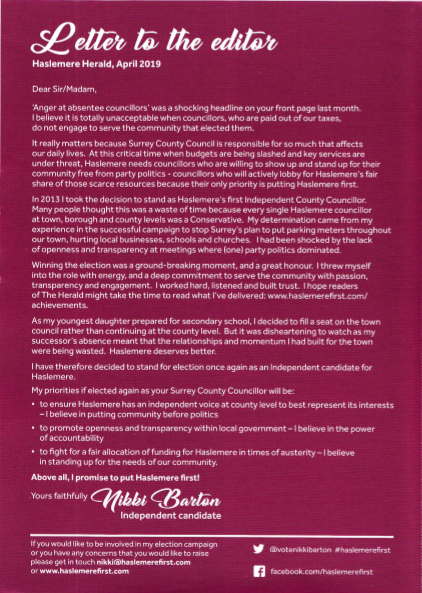 This entry was posted in Councillor Barton Update, Haslemere first and tagged Haslemere, Haslemere first, Surrey County Councillor on October 27, 2013 by admin. The Haslemere and Western Villages Task Group meets today. The meetings are held in private but I’ll happily share things I’m thinking about that I hope to bring to the meeting. Clearly this is not in priority order. Many items have been discussed with SCC Highways. These topics have been collated through Haslemere Vision feedback. Bear in mind each item has a different price tag and funds are very limited. Some items will not be taken forward. Other items may be added. Gateways on the 4 main approaches to the town: Aimed at enhancing sense of place and influencing driver behaviour/speeds. Feasibility study: Safety improvements at Shepherds Hill j/w Courts Hill Road: Aimed at assisting pedestrian/cycle movement across the A286. Ornate railings at Claytons Jewellers: To match Lower Street/Shepherds Hill. Pedestrian crossing at the museum: Pelican (signal crossing) rather than zebra at this location due to speeds/width. Feasibility study: Pedestrian crossing Shepherds Hill: Crossing at j/w Lower Street. Feasibility study for Haslemere/Weyhill cycle/pedestrian network: To include looking at off-road link using Network Rail land by Jewsons. De-clutter town centre and Wey Hill parade: Rationalise signs/railings etc. Lighting upgrade Wey Hill parade: Conservation lighting columns to match High Street. Pedestrian crossing Wey Hill at St Christopher’s Green: Probably Zebra as speeds thought to be low. A286 Grayswood Road pedestrian crossing. A286 Grayswood: Refurbish traffic calming by renewing red banding. This entry was posted in Haslemere first, Meetings and tagged Haslemere, Haslemere first, Surrey County Councillor on October 21, 2013 by admin. A summary of items I’ve been dealing with in the past couple of months. Wey Hill: Confirmation from Mark Borland, SCC Highways, that significant patching of Wey Hill will take place on 11th November, 2013 removing all visible defects and potholes. In May/June 2014, the road will be ‘surface dressed’ providing a protective coating over the patching work delivered in November to deliver an overall new road surface. Unfortunately the surfacing material cannot be laid when temperatures are low, hence the delay until spring/summer next year to complete the scheme.I have requested that Highways consider using this resurfacing opportunity to improve pedestrian safety in Wey Hill and instate a crossing using the existing build out and drop curb at the top of Wey Hill/St Christopher’s Green. This is an issue that will be brought to the Haslemere and Western Villages Task Group for discussion. Shepherds Hill lime tree: Agreed with John Hilder, SCC Highways, to wait for Haslemere Town Council decision on way forward. SCC will contribute to the tree. Haslemere Society has also expressed interest in contributing to a replacement tree. 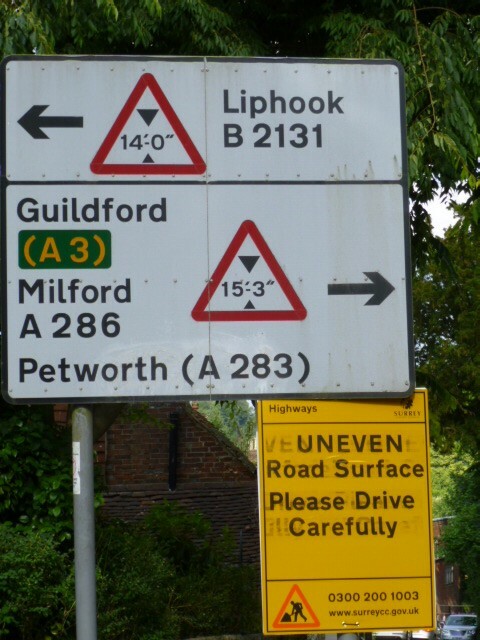 Critchmere traffic survey: John Hilder, SCC Highways, is to chase up on post Hindhead tunnel opening/impact of traffic calming survey in Critchmere. High Street railings outside Clayton Fine Jewellery: Railings semi repaired by SCC work gang, but apparently work stopped when May Gurney work gang arrived on site. I have asked Highways for clarification, and for any possible funding, to replace the railings. National Trust notice board to promote Swan Barn and other activities: permission given by SCC Highways to situate outside Boots in the High Street subject to agreement on design by WBC conservation officers and with the understanding that SCC does not take responsibility for maintenance. Awaiting confirmation from SCC Highways on responsibility for installation. Rex Cinema plaque, Wey Hill: Permission granted by SCC Highways for installation of memorial stone and the memorial service will take place on September 22nd. Derby Road, St Bartholomew’s School: Made a request to David Hodge that a solution should be found to make the currently unadopted, potholed section of Derby Road in front of St Bart’s school safe for children, staff and parent access. John Furey, Cabinet member for Transport, was asked to report on all schools across Surrey sited on unadopted roads. There are currently 10. The initial report suggests resurfacing 85 meters of Derby Road to a standard that would last 10 years at a cost of £17,000. I am waiting for a response to my question on how this repair would be funded. Two Parks Project: Met with Paul Fishwick, project coordinator to discuss Haslemere as a gateway to the South Downs National Park, including cycle signage, upgrading of sections of the Serpent Trail, the Sunday Midhurst bus service that will start next summer and the potential for improved signage at the station for visitors. Discussed the possibilities of improving facilities for commuters accessing the station by bicycle on the back of the Two Parks project station upgrade, and ensuring that new signage includes Devils Punch Bowl and wider tourist information. Attended the National Parks sustainable transport stakeholder conference, Sept 12 in Brockenhurst in my role as champion for Haslemere within the South Downs National Park. Draft Cycling Strategy: Surrey County Council’s draft cycling strategy is now out for public consultation. The strategy has been developed with input from borough and district councilors and sets out SCC’s aims and objectives to increase the numbers of Surrey residents cycling safely whether for travelling to work or school or for leisure and health. It also sets out what is proposed to manage less positive aspects of cycling such as cycle casualties and large numbers of cycling event in some parts of the county. The consultation runs until 1st November. All the documents are available on the County Council website: www.surreycc.gov.uk/cyclingstrategy. I plan to work with Lesley Harding, SCC ‘Sustainability Group Manager’, to develop a Local Cycle Plan for Haslemere during 2014. Safer cycling and walking access for all ages has been identified as a key issue in the Haslemere Vision public consultation to date. It is very positive that SCC is developing a countywide strategy. Haslemere is well placed to benefit from synergies arising from improving cycle/walking provision for local residents, commuters and tourists. Surrey set to lobby for Crossrail 2 and new stations: The county council will argue the case for Crossrail 2 to come into Surrey, as well as for the possibility of new stations at Park Barn and Merrow in Guildford. Article here. Kings Road exit: no left turn: have requested that signage be reorientated, at present it has twisted round and is not fully visible from the junction. High Street cobbles: SCC Highways to assess if cobbles need to be re laid to improve pedestrian safety. Town Hall grass triangle: awaiting response from SCC Highways regarding refurbishment/paving of triangle grass border which is permanently damaged. Fernhurst Fracking: SCC Highways input to the Waverley Borough response to West Sussex consultation for a scoping opinion: requesting thorough analysis of: potential traffic implications on Haslemere, noise, dust, odour of traffic and operations, impact on drainage and water supplies in the area, impact on landscape and impact on biodiversity in the area. Sturt Farm development: SCC Highways are not aware at present of this planned application. I understand the next public consultation by the developer will be 23rd Sept 4-8pm in Hasleway, Lion Green. If there is a formal application, it will be submitted to Waverley Borough Council. List of Waverley Councillors representing Haslemere here. Traffic management at the Coombers triangle: I have questioned the need for this and feel the funds (approx. £2000) could be better spent elsewhere in Haslemere. As the funds have already been allocated by the LAC it may have to go ahead. Haslemere and Western Villages Task Group will meet in Oct/Nov, 2013. I will be sending through a provisional list of items for discussion for feedback. 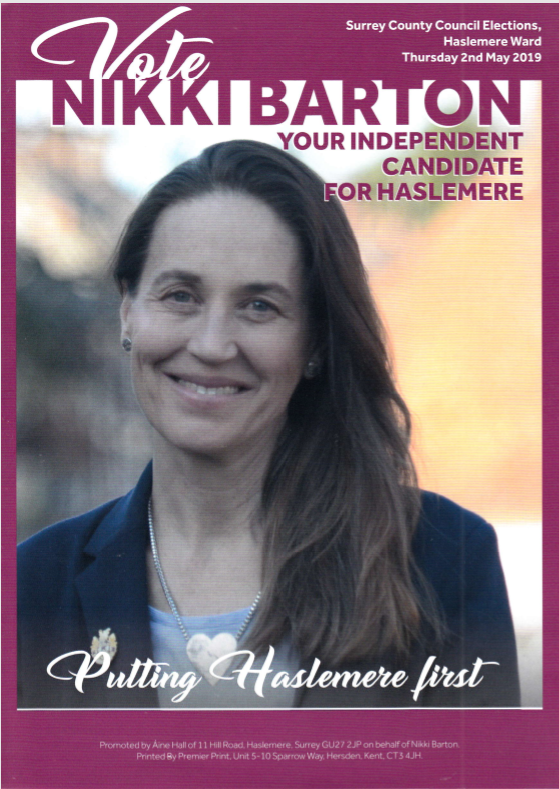 Haslemere Vision: I spoke at a session of Haslemere Vision on Saturday 14th September. This session was a briefing and workshop on what can be in a neighbourhood plan, the process of plan preparation and the planning context behind neighbourhood planning. I’d like to draw your attention to an event relating to Haslemere Vision on Saturday September 28th. A “visioning” workshop at which the groups will start on the process of developing a shared overarching vision for Haslemere and the Villages in 15 or 20 years time. It will run from 2:00pm till 4:30pm at the Church Hall of Our Lady of Lourdes Church on Derby Road. Also, please consider taking the time to have your say in Haslemere Vision’s engagement survey. Next Local Area Committee meeting will be on 20th September 2013 at Cranleigh Village Hall. These are the documents relating to this meeting. Town Council Update: Presented the above to Haslemere Town Council on 11th September. Lower Street Temporary Traffic Order.The Temporary Traffic Order is required to enable the laying of a new water supply on behalf of Thames Water. The works are anticipated to take place on Sunday 29th September and Sunday 6th October 2013 between the hours of 09:00 hrs and 16:00 hrs within the one month order which commences on the 29th September 2013. View Lower Street – Diversion Diagram. Stoptober is back and people around the country will take the 28 day challenge to stop smoking during October. Last year over 160,000 people successfully quit smoking for Stoptober, thanks to the wide range of quitting support available. Surrey Stop Smoking Service is supporting the event and will be offering free help and advice to those who want to quit. By stopping for 28 days, people are five times more likely to stay smoke free. Residents who want to give up smoking may visit www.surreycc.gov.uk/stoptober or call 0845 602 3608 to find out more information. This entry was posted in Haslemere first and tagged Haslemere, Haslemere first, Independent Councillor, Surrey County Council on September 15, 2013 by admin. There have been conversations with residents and SCC on this issue. As well as arranging a site visit with John Hilder (Local Highways Manager), I also met with Trevor Pugh (SCC Highways Strategic Director, Environment and Infrastructure) to request urgently needed road repairs on the A286 on Shepherds Hill. While individually the potholes apparently fail to meet the ‘safety matrix’ requirements for immediate repair by SCC Highways, I explained that drivers are now swerving to avoid the ‘chicane’ like series of potholes, onto the opposite carriageway creating a significant safety hazard. In addition, I pointed out that a large number of valuable vintage cars and motorbikes will be travelling up Shepherds Hill en route for the Festival of Speed at Goodwood this weekend. I have been pressing SCC Highways for a date for the Project Horizon resurfacing, but as I understand that likely date for this will be October/November at the earliest, I requested that a decent quality repair of the holes be made before the Festival of Speed traffic starts arriving. Good news, or so I thought, I heard on 12th July that Shepherds Hill should be repaired on that same day, before the Festival of Speed. Unfortunately, SCC’s contractors repaired just one pothole. This is very disappointing and the contractors have now placed signs at the foot and top end of Shepherds Hill. I’ve been informed that tree branches are obstructing sight lines. I’ve spoken with officers about this. Attended Haslemere and Villages Vision steering group meeting. The Vision is a non political, community led forum to enable everyone who lives or works in Haslemere and surrounding villages to pool ideas and resources to create a master plan for future development. The Vision has pledged to use new Localism powers to undertake and deliver projects that preserve and enhance the wellbeing of the area for the benefit of all those associated with it. A new questionnaire (click here) has been launched this week on the website (www.haslemerevision.org.uk) to ensure as many views as possible are taken into account (paper copies available at the Town Hall, Haslewey, The High Lane Community Centre, Haslemere Library and Haslemere Hall). After many months of preparation the Vision will start to work on drafting the Haslemere Neighbourhood Plan in September. More volunteers are needed to join both the steering group that will lead the process forward, and the five working groups to develop the policies and proposals that will inform the plan. The 5 work groups are: 1) Transport, traffic and parking 2) Environment- built and natural (including housing) 3) Economy and Local Business, 4) Culture, Education and Leisure and 5) Well being Health and Inclusion. Please get in touch with Haslemere Vision via the website or email info@haslemere.org.uk if you are interested in any of these issues and want to play a part in Haslemere’s future. The Vision is open to everyone, and everyone’s views count. Met with Tom Budd, Surrey Police Neighbourhood Commander who is based at the Bury’s, Godalming to understand the policing provision for Haslemere. Haslemere is one of the communities within the Waverley Safer Neighbourhood Team, which includes 13 Neighbourhood Police Officers, and 17 Police Community Support Officers (PCSO’s)who deal with local issues and low-level crime. PCSO’s have the power to seize alcohol, drugs and to stop vehicles requiring the driver to provide name and address. They have no powers of arrest. Haslemere, Grayswood and Chiddingfold are served by Neighbourhood Police Officer PC Swindell and Community Support Officer George David. (http://www.surrey.police.uk/my-neighbourhood/waverley/wvhg/meet-the-neighbourhood-team). Meet your Neighbourhood Staff, August 6th, 11-12.00am at Haslemere and District Community Hospital, Church Lane, Haslemere. Emergency response team based in Guildford responding to 999 calls. Each shift has 4 cars located around Waverley. The mission statement of the partnership is “Feeling Safe and Being Safe in Waverley”. An annual Strategic Assessment of crime and disorder issues in Waverley is carried out and an action plan is drawn up showing how the partnership intends to tackle the issues highlighted. The Partnership also works with many other organisations to deliver projects and improve community safety. The Partnership has several delivery groups focusing on areas, individuals and different types of crime and disorder. It also links with groups at divisional, county and regional level. Youth intervention team enters into acceptable behaviour contracts with young people. As a measure of the success of the strategy, there has not been a report of antisocial behaviour on Lion Lane, Haslemere in the past 6 months. Haslemere officers PC Swindell and PC Will Davis are very proactive locally. Safer Waverley initiative identifies local trouble hotspots where individuals are either causing trouble or are vulnerable. The Community Incident Action Group brings all parties together as part of a Joint Action Group to make sure that the proposed interventions are the most effective. Tom Budd highlighted the disconnect between public perception of crime levels and the reality. I raised the question of household burglary and was very surprised to learn that there are on average 10 ‘dwelling’ burglaries per month across Waverley, (the burglary hot spot is Farnham) and on average 40-50 non dwelling thefts (sheds, garages etc) per month. The Commander stressed that community feedback is vital in building up an intelligence database. We also discussed the often hidden issue of domestic violence, often linked with high levels of alcohol consumption. The problem is growing due to the pressures of economic recession. Commander Budd explained how victimless prosecution is possible if a victim is too afraid to testify, and safe sanctuary is provided where needed. The Christian Alliance charity receives partnership funding to provide support for survivors of domestic violence. Surrey police work closely with Sussex and Hants forces via embedded officers, joint operations and regular cross border crime meetings to share information. I expressed my appreciation for George David, Haslemere’s wonderful Community Support Officer. George is a very positive presence in the town, who regularly helps St Bart’s children with the walking bus, and crossing to get to school. I discovered last year that he helps the walking bus even if he is officially not on duty and so not being paid for his time. George definitely goes the extra mile and I believe Haslemere is very lucky to have him working in our town. Received a number of emails from residents concerned about Celtique Energie’s planning application to the South Downs National Park Authority for “the siting and development of a temporary exploration borehole, well site compound and access road including all associated infrastructure and equipment, for the exploration, testing and evaluation of any discovered hydrocarbons through the drilling of a vertical, and a contingent horizontal well from the same borehole:” at Nine Acre Copse, Fernhurst. A campaign group has been established http://www.frackfreefernhurst.com/. Clearly if large shale gas reserves are identified as being exploitable, there will be a considerable environmental impact on Haslemere, arising from an increase in lorry traffic through the town and the potential long term impacts of the fracking process on the ecosystem in particular on water resources. I understand fracking has been banned in France, Germany, Switzerland, Austria, Romania, Bulgaria and several states in the USA due to environmental concerns. It is a new topic for Fernhurst and environs and certainly one in which it will be vital to understand many implications, both for and against. Received a reply to my email sent to SCC leadership expressing my concern about the state of Derby Road in front of St Bartholomew’s School. Apparently there are a number of schools across the county in the same position as St Bart’s, sited on private, or unadopted/unmaintained roads. SCC has agreed to address the issue to try to find a way forward. This is an excellent step forward. Residents only parking permits have been introduced around Haslemere. The impact of the scheme will be reviewed and reported in the December parking review. Feedback can be sent to David Curl, SCC Parking Team david.curl@surreycc.gov.uk. Met with Jim Edwards, Waverley Borough Councillor (Shottermill Ward) and Haslemere Town Councillor, and David Curl to discuss parking issues on Lion Lane. David Curl has agreed to include key issues in the December parking review for consideration. Yellow lining to improve safety for Shottermill Infant School pupils, and to provide passing spaces on Lion Lane have been implemented this week. Provided written support for HTC application to SCC Community Improvement Fund to upgrade and refurbish play equipment on Lion Green. While delighted that Waverley have acted so swiftly, following the meeting I recently organized at the Georgian to see how collectively we could support businesses in the town, I am concerned that the parking permit scheme pilot has not been developed with any wider consultation with the business community. The pilot scheme proposes to sell an initial 50 permits for £50/year giving the holder parking between 3-5.30pm in the Waitrose car park. There are many examples of successful initiatives across the country as other councils are supporting their high streets. For example, Chester’s ‘Free After Three’ parking scheme introduced 3 years ago has greatly increased footfall in the towns shops, and has been successfully copied by many towns. Given the feedback that the recent increases in parking charges in the Waitrose car park are having an impact on the number shoppers who stay on in town to visit other shops, I am disappointed that WBC are not able to go further and work with a wider group of stakeholders to develop a more substantial initiative that would have more impact in attracting shoppers to the town. Met with other 8 independents/RAs councillors in preparation for full council on July 16th. One of the issues discussed is the £100,000 performance related bonus that will be awarded to David Mc Nulty in 2018, and the appointment of a number of cabinet associates without any full council consultation. The Haslemere District & Chamber of Trade will be hosting an event in Haslemere Hall on Tuesday 16th July ‘CREATING A BUZZ ON OUR HIGH STREETS’. Click here for more details. This will be on Friday 19th July 2013, 7pm to 1pm and Saturday 20th July 2013, 12pm to 11pm at Haslemere Museum. More information here: FOUNDERS FEST flyer. This entry was posted in Haslemere first and tagged Haslemere, Haslemere first, Independent Councillor, Surrey County Council on July 14, 2013 by admin.